Andy Puddicombe: I take a moment to be grateful for having woken up. And then I meditate. Unless the children are already awake, which means meditating later in the day instead. AP: Love, space, creativity and play. These four things, in no particular order, and tied to no specific person, place, activity or thing, are very important for me to feel energized. AP: Meditation is perhaps too obvious, but it’s real, and it works. Sure, there are all the usual health benefits that people talk about, but it seems that the qualities of mind that meditation promotes, such as compassion, forgiveness and understanding, is what will ultimately move the needle – both for our own health and happiness, and also that of the world. AP: The Way of the Bodhisattva by Shantideva. AP: My relationship with the phone is that it is (currently) an inanimate object, that I can choose to set up and use in a way that helps me to live a healthier and happier life. When I get a new phone I strip it back to basics. I have no notifications, no sounds. I often have my phone on silent. I have no email or social media on the home screen, and choose instead to see a picture of something that makes me happy, and reminds me of what is most important, each time I pick it up. In order to access email or social apps, I have to make a conscious decision to swipe to another screen. This sounds like a small thing, but it often makes the difference and can prevent mindless scrolling. I choose apps that help me live a healthier or more informed life. I choose not to download others. In terms of sleep, we are pretty much phone-free in bed. Although we both use WHOOP to track our sleep and recovery. For me this a great example of how beneficial technology can be when used in a positive way. AP: I strive for zero inbox everyday. It helps keep me sane and forces me to be efficient. I don’t always make it, and that’s fine too. I’m very fortunate to have an assistant who helps me with this. AP: Give me 15 minutes and I’ll stretch, meditate, or do something creative. Give me an hour and I’ll go for surf! AP: The time that really stands out in my life was back in university, before leaving to become a monk. I was studying hard, working hard, and playing hard too. It just didn’t leave any space for recovery or reflection. Whilst I would obviously never recommend burnout, on this particular occasion it encouraged me to really look closely at my life, and to consider if what I was doing was contributing to a feeling of happiness and contentment. It was this period of reflection that led to me meditation and life as a Buddhist monk. So although painful, it was an incredibly valuable learning experience and something that led to an experience that I will always be deeply grateful for. AP: I don’t want to avoid the question, and yet I do not really subscribe to this conventional notion of failure and success. There is just life. Everything else is a concept, an idea, a judgement of the mind. Sometimes things go well and we should appreciate them because they may not last. Sometimes things will not go as we would like, and we can be at ease with them knowing they will pass. Sometimes we think things have ‘failed’ and yet something very positive comes out of it, so through this lens we could call the failure a success. At other times, we might think we have some ‘success’ only for it to turn out challenging or unsatisfactory in some way, perhaps even perceiving it as a failure. There is sometimes this idea that if things don’t go as we anticipated, then it is wrong, that we have failed. But this ignores the unfolding nature of life, the need to learn, practice and refine all that we do. It is impossible for every single thing to go as we would like it to first time around. This is not failure, this is learning, this is life. AP: “Keep death by your side.” At first this may not sound very inspiring, but one of my Tibetan teachers shared it with me one time and it has stayed with me ever since. The context is that we miss so much of our life because we think that life will go on forever. Because of this, we do not notice each passing moment, we perhaps take others for granted, and we do not appreciate the value of this precious human life. But if we live with our immortality as a daily experience, then we will live a happier and healthier life. This simple idea has given me both strength and peace over the years. 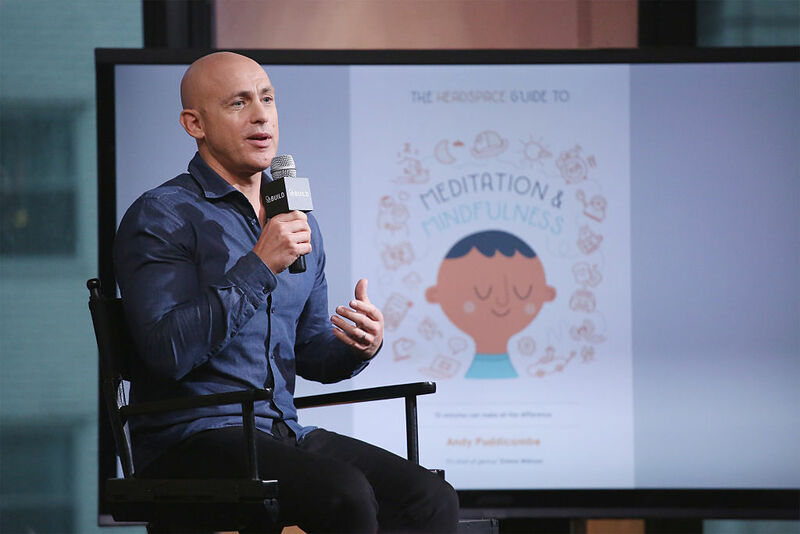 Andy Puddicombe is the co-founder of Headspace.